India’s largest multinational flexible packaging materials and solution company, Uflex Limited, has been working with several grape growers internationally to demonstrate the benefits of Flexfresh liner bags. Flexfresh Liners use the natural respiration process of grapes to increase the carbon dioxide (CO2) to the desired levels using Active Modified Atmospheric Packaging (AMAP) technology. The available oxygen inside the liners is consumed by the grapes in a few days and is replaced by CO2. The AMAP technology maintains the higher CO2 levels in equilibrium due to the specially formulated polymer combination. The additional benefit in using it for grapes is moisture control. While allowing the product to respire in hydrated oxygen, it releases excess humidity ensuring that the grapes are dry. The overall improvement to the freshness has gone up dramatically. Since the grapes are dry, unlike the conventional macro perforated liner bags and with incremental CO2 acting as a fungicide, the grapes can remain healthy and fresh for a longer period of time. Botrytis is a common disease caused when grapes are wet for a long period of time. The usage of sulphur pads has been proven effective to arrest the growth of the fungus. However, due to the long shipping times from the harvest to the point of consumption, vapors of sulphur are absorbed by the grapes, giving irritation to consumers during consumption. In fact, there are numerous instances of consumers complaining back to the retail stores about heavy sulphur and the irritation caused. 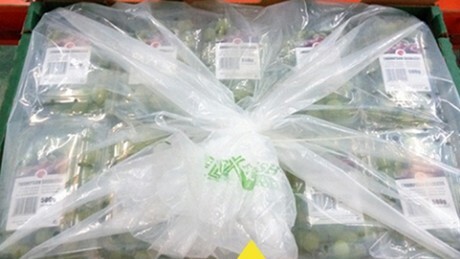 2019-03-08 "The quality of our Chinese grapes is guaranteed by adherence to organic standards throughout the production process"
2019-03-06 "This year, for the first time, we will offer Indian grapes in 250g packs"
2019-03-05 UK: "Market for white grapes has now recovered, but red is still in a bad place"
2019-03-01 Has the grape market reached its tipping point?